Corrosion in the aerospace industry. Part 1 Corrosion fundamentals and cost of corrosion: Assessing the cost of corrosion to the aerospace industry; Corrosion and the threat to aircraft structural integrity; Effect of corrosion on the mechanical behaviour of aircraft aluminum alloys. Part 2 Corrosion monitoring, evaluation and prediction: Nondestructive evaluation of corrosion in the aerospace industry; Corrosion prediction in the aerospace industry; Integrated health and corrosion monitoring systems in the aerospace industry; Corrosion and fatigue modelling of aircraft structures. Part 3 Corrosion protection and prevention: Corrosion control in space launch vehicles; Coating removal techniques in the aerospace industry; Novel corrosion schemes for the aerospace industry; Greases and their role in corrosion control in the aerospace industry; Business strategies for corrosion control in fleet maintenance. Corrosion control in the aerospace industry has always been important, but is becoming more so with the ageing of the aircraft fleet. Corrosion control in the aerospace industry provides a comprehensive review of the subject with real-world perspectives and approaches to corrosion control and prevention. Part one discusses the fundamentals of corrosion and the cost of corrosion with chapters on such topics as corrosion and the threat to aircraft structural integrity and the effect of corrosion on aluminium alloys. Part two then reviews corrosion monitoring, evaluation and prediction including non-destructive evaluation of corrosion, integrated health and corrosion monitoring systems, modelling of corrosion and fatigue on aircraft structures and corrosion control in space launch vehicles. Finally, Part three covers corrosion protection and prevention, including chapters which discuss coating removal techniques, novel corrosion schemes, greases and their role in corrosion control and business strategies in fleet maintenance. 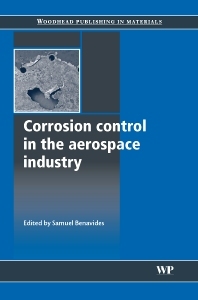 With its distinguished editor and team of expert contributors, Corrosion control in the aerospace industry is a standard reference for everyone involved in the maintenance and daily operation of aircraft, as well as those concerned with aircraft safety, designers of aircraft, materials scientists and corrosion experts. Samuel Benavides is a Senior Materials Engineer with the Aging Aircraft Branch of the US Coast Guard.